A business on the outskirts of Motherwell is leading the charge in raising awareness of bee population decline. Alison Bell is the operations director at Plan Bee, a North Lanarkshire business that offers beehive adoption, management and educational services. Bell explains that educating young people across Scotland about the threat to bees and the impact of population decline is a key element in getting their environmental message out there. 'Most of our work is focused on education. 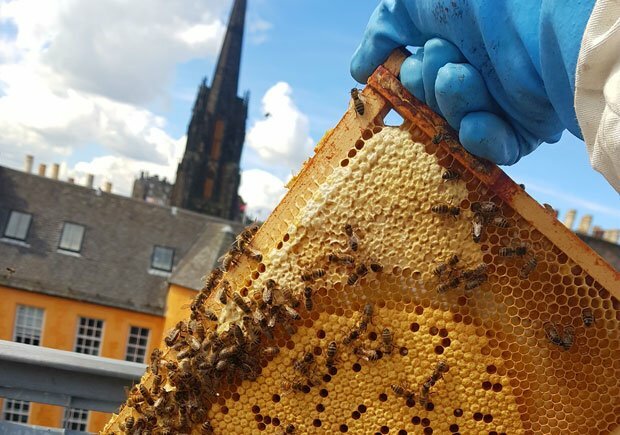 As 2018 is the Year of Young People, we're excited to have beehive management introduced to the Scottish curriculum,' says Bell. 'This means that children are learning more about the environment as part of their education. Plan Bee have also launched a project with VisitScotland where school kids have taken over hives at House for an Art Lover in Glasgow's Bellahouston Park and will take part in education workshops to look after 40,000 bees. The business also produces raw honey, available under the Origin Honey brand, and have already won several awards for it. In addition, they've launched honeygar – apple cider vinegar, mixed with raw honey, which can be used as a salad dressing – and they're passionate about supporting and promoting local honey, which has the benefits of not requiring processing and enjoying a long shelf life. Providers of beehives for adoption by buinesses, communities, schools and other organisations, with a strong sustainability message. Sells cold extracted and unpasteurized honey as well as honeygar dressing.